You may recall a post I did a little while back about how to find a credit card in Japan with a poll for those who have a card or have tried to get a card. I've finally summed up the poll responses and have shared them below. Just over 100 people responded, but I deleted several because of missing information or the respondent hadn't actually ever tried to get a credit card. While this is an informal poll and, of course, does not explain all situations, whether personal or those reflective of a credit card company, some of the information may be of use to those hoping to get a credit card in Japan. 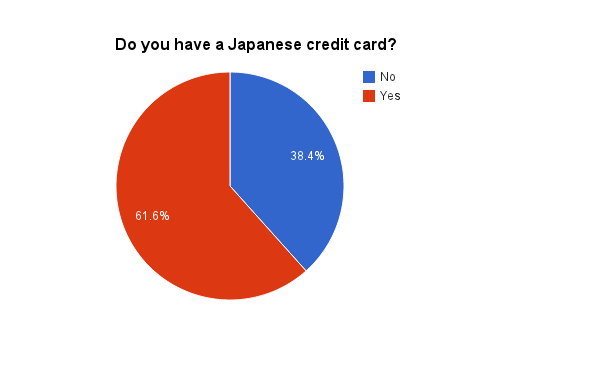 Out of 86 responses, 61.6% percent said they do have a Japanese credit card, and 38.4% do not, though they have applied at least once, as indicated below. 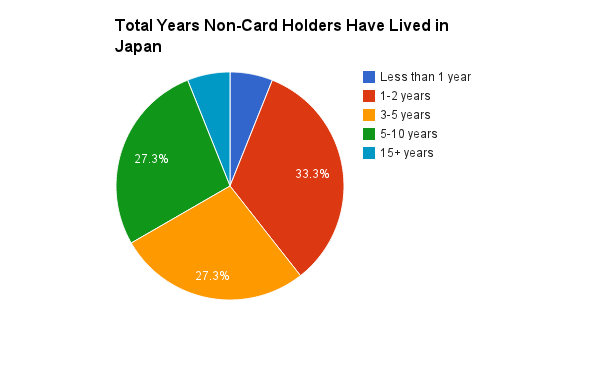 Those who have at least one Japanese credit card have lived in Japan varying lengths of time, with most of the respondents having been here between three and five years (30.2%), although the 5-10 years and 10-15 years categories aren't too far behind (22.6% and 18.9%, respectively). 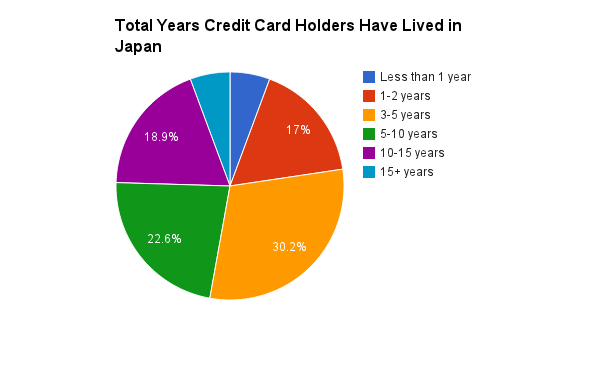 Comparatively, more non-credit card holders have lived in Japan for one to two years (33.3%), versus the 17% of credit card holders, as you can see below. The 10-15 years category is missing from the latter chart because it was not chosen by any respondents. 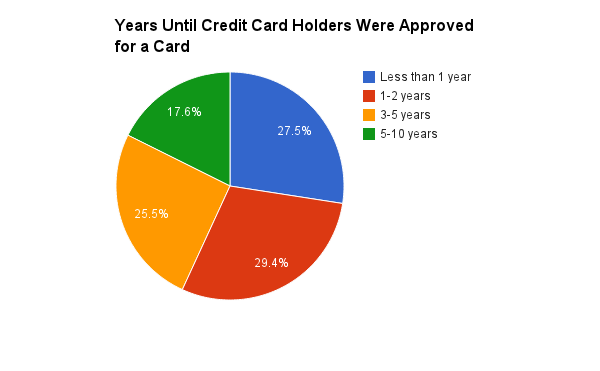 How long did card holders live in Japan before they were approved for a credit card? Interestingly, it was relatively even between the less than 1 year, 1-2 years and 3-5 years categories (27.5%, 29.4% and 25.5%). So, though most card holders have lived in Japan for more than three to five years, it seems that many of them were able to get a card not too long after arriving. Let's look at job type and income. 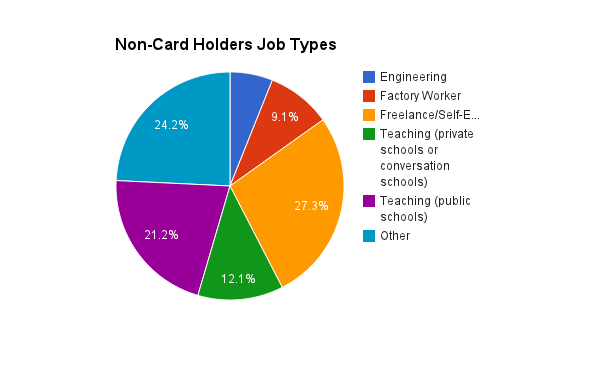 Credit card holders in Japan, according to this poll, are mostly teachers at private schools or eikaiwa (conversation schools), but then again, I wouldn't be suprised if a good majority of expats in Japan have these types jobs, so this may be due more to that than their job type influencing whether they got a card or not. Otherwise, teaching in public schools was the next most common, followed by engineering and business. The "Other" category includes jobs that only received one response, such as Medical/Healthcare or Public Relations. 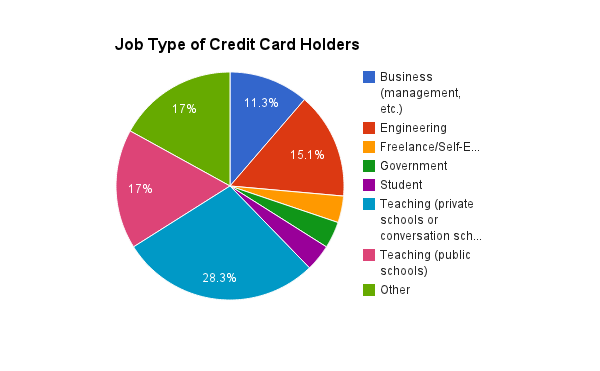 For non-card holders, I was surprised to see that the "Freelance/Self-Employed" category was the most popular (and I would guess might appear a bit more risky to some credit card companies, but not necessarily in all cases). The "Other" category includes, again, any job type that received just one response. 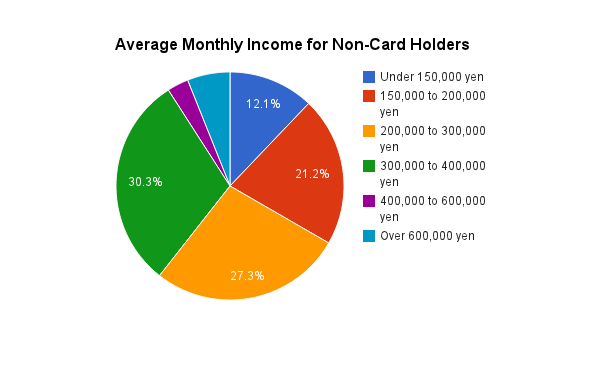 Card holders' average monthly income varied, as I expected, but the two largest categories -- more than half of respondents -- include anyone who makes somewhere between 200,000 yen and 400,000 yen a month, as you can see below. 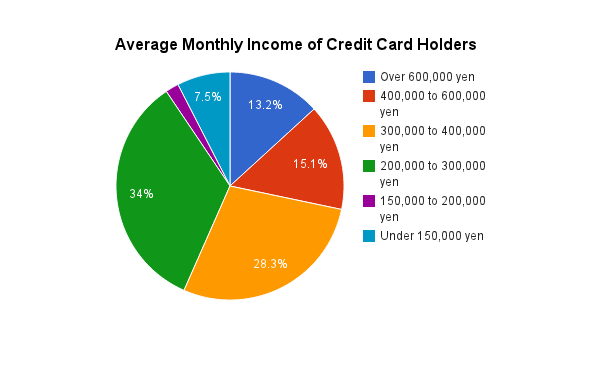 Non-card holders' average monthly income is actually mostly similar to those who have a Japanese credit card, so it doesn't seem -- according to this survey anyway, as I'm sure it varies -- that income plays a large role on whether you can get a credit card in Japan or not. Some folks said they were able to get regional cards, debit-type cards, and different JR cards (J-West, Express Card JR Tokai). Honorable mentions for card application rejections include Tsutaya, ANA, MUFG, Saison, and several regional/local/store-specific cards. Many of you shared your experiences getting a credit card in Japan, several of which I've posted below. "I tried asking at my local bank branch and flat-out was told that I can't get a credit card as I am a foreigner. But, sending in the application direct to the bank a few months later, no problems at all!" "It was very easy and I didn't speak or write Japanese at that time, but one of the bank employees translated and even filled out the form for me. But keep in mind that this was in 2003, I'm half-japanese and the bank personel knew my mother." "Went to bank for a new cash card. The gave me a credit card instead." "My visa is connected to my bank account. My Japanese husband was with me and mostly filled out the paperwork. I had already had another account with that bank for over five years." "I applied right after arriving in Japan because the bank suggested it, though I knew I would be rejected. And I was. But I was told that if I tried after living in Japan with a steady job and residence for a year I would be fine." "I didn't actually apply for or even request my card. I went into the post office bank to update my address after moving house and they said, 'since we have to issue a new ATM card anyway, why don't we just make it a credit card?' After hearing a lot of stories about people getting rejected by half a dozen companies before managing to get a card it was a bit of a surprise!" "I knew I wouldn't be accepted but the second time (with JP bank) they really insisted on my applying. I don't really need a card so didn't try anymore." "My friend had to ask his employer to call the bank to force them to give him a card... although he had a permanent (engineer consultant) position and was in Japan for more than 5 years at the time." "My Japanese wife is not working and got a Rakuten credit card based on my income and my bank account. Myself, who is the account holder and who gets the monthly pension from the European Union in my Japanese account have been refused by Rakuten." "I am on a five-year visa but I have been flat out denied for every credit card I've applied for, and I've been told this is because of my visa status, because I have a non-resident visa. So I'd advise people to ask someone if their visa will allow them to get a Japanese credit card before they waste their time like I did! I couldn't even get an iPhone from Softbank because of this (unless I bought it outright, no monthly payments were possible)." Then there's card-specific issues. A lot of people might have success with one type of card, but then just as many people might be rejected. "Getting the JAL Card was an ordeal. Getting the Marui and Yodobashi Camera cards was very easy. No effort." "I tried a lot of cards in the first three months I was here. I heard from another foreigner at my job that she was able to get one after being in Japan for six months. I was accepted for the first card I applied for when I tried after being here for six months. I also heard it's easier to get a card from your bank (which is what I did). Some places (like Marui) rejected me just because I couldn't speak Japanese." So what's the easy answer? I'm not sure there is one, as it seems credit card companies or banks often make decisions arbitrarily. A job with steady income and a longer visa might be all you need to get a credit card in Japan at a lot of places, although a couple students said their applications were successful. Applying to several different places, even more than once, might result in success. Or, even if you're turned down for a card, you might be approved if you reapply in a few weeks or months. My husband, an English teacher at public schools for the past five years, applied for a few cards this summer in the midst of our moving and was approved for the Rakuten card, a local card and a JR card. He was turned down for the popular Life visa card. He applied for all of them online. I know some of you have mentioned being turned down for short visas or not being able to speak Japanese -- has anyone else inquired as to why they may have been turned down? Do you have any other tips or experiences to share in regards to getting a credit card in Japan? Also, learn how to find a credit card in this post, and how to apply for one online. Many thanks to all of you who responded to the poll!